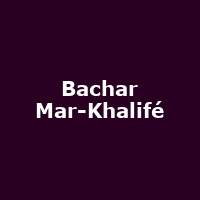 "Bachar Mar-Khalifé is a French Lebanese singer, composer and multi-instrumentalist. Born in war-torn Lebanon, he is the son of the legendary oud virtuoso and composer Marcel Khalifé. He has collaborated on many projects that fuse jazz, Arab musics, electronica and hip-hop with artists as diverse as Bojan Z, Carl Craig, Francesco Tristano and Murcof. He first album was 2010's "Oil Slick", released with Marcel and Rami Khalifé, followed by "Who's Going to Get the Ball from Behind..." (2013) and 2015's "Ya Balad" (which translates as: "Oh Country"). "Ya Balad" is a projection of Bachar's childhood memories and the paths of exile, mainly sung in Arabic as an open letter to Lebanon, his native country."